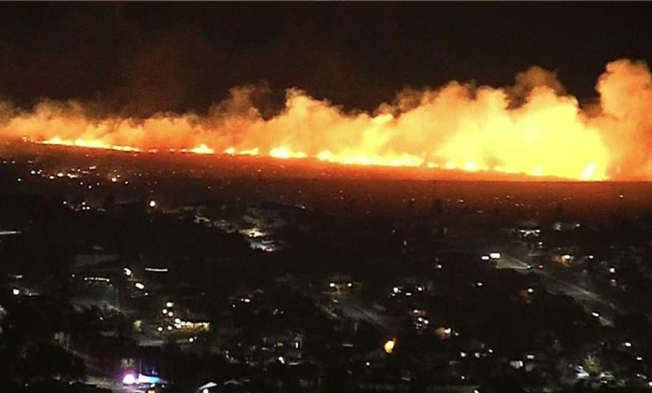 Palm Springs brush fire under investigation; hot spot briefly reignites Wednesday. Scorched land covered in rocks was the result of a 40-acre brush fire that burned Tuesday night in northern Palm Springs and nearly forced homeowners to evacuate. No one was injured in the blaze, but firefighters briefly returned to the Chino Cone area to extinguish a hot spot that reignited Wednesday morning. The scene was otherwise clear as investigators worked to determine the cause of Tuesday night's fire between Racquet Club and Tramway roads. On Wednesday morning, Palm Springs Battalion Chief Jason Loya said, "The weather and the wind were a huge factor in this." It’s already hot in So Cal whole our new Gov is up cutting deaf trees instead of defending all the old Santa Rosa type communities from flying embers. M Fire has a cost effective plan to retro fit all attic vents with tight double screen system and a fire inhibitor erosion control mulch around communities. Our Mighty Fire Breaker Mulch can be sprayed around communities and be ready to stop a wild brush fire 3 months after we spray it. If you are a government official ready to help us add better safer chemistry to defend homes and lives reach out to Steve at M Fire he has testing to prove it.